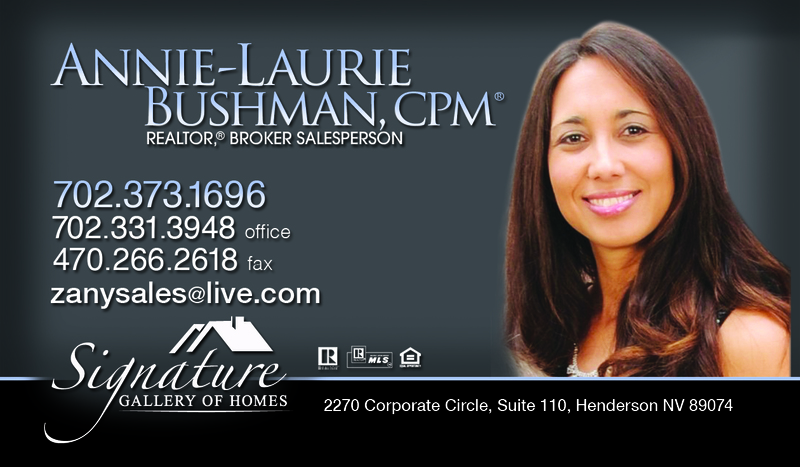 Signature Gallery of Homes in Henderson Nevada is pleased to anouce that Annie-Laurie Bushman has joined the team. Annie has more than 8 years of experience in real estate and property management, Annie Bushman has had the pleasure of representing home buyers, sellers, landlords, and tenants with their real estate transactions in the Nevada market. Previously, Mrs. Bushman served as Designated Broker and Office Manager at Gold Club Homes, where she oversaw day to day operations. In her role Annie was responsible for executing client contracts, managing accounting/payroll, as well as developing and implementing operational procedures, all while ensuring clients received the highest level of service. During her time there her mentor Clayton Kennedy, Broker/Owner of Gold Club Homes, guided and inspired her to excel in her career as a CPM. Mrs. Bushman has completed all CPM certification courses in less than a year and is looking forward to her next endeavor as a CPM. She loves real estate and plans to further her education by becoming a CCIM member in the near future. She was a member of the GLVAR Grievance Committee for 3 years and is a Risk Reduction Graduate. Annie was born in Arizona and raised in Las Vegas, NV. She has been married for over 15 years and has two children. In her free time she enjoys snowboarding, boating, and spending quality time with her family.